A great voice frightens a cowardly lion, bewilders a brainless scarecrow, and alarms a heartless tin man as a little girl with awful red kicks seeks to follow an elusive golden thoroughfare. If I only had a brain meets pusillanimous blubbering and ungainly rackety metal sauntering. An endeavor spear-headed by the tenant of what should be a picnic table cloth but fashioned to form a dress climaxes with the unveiling of a great wizard to be only a diminutive man. Behind a curtain these four friends discover the great wizard is merely human, limited to a microphone and nifty cinematography. This great exposition reveals a source of an outwardly experienced phenomenon. An unseen variable dictates exaggerated output. What you see is not what you get. The great wizard is a gimmick that should resonate with people of faith. Adjectives ascribed to people of faith are not very becoming on the large majority. Uptight, judgmental, awkward, brash. Words are powerful, especially those derived from an outside perspective. Self perception is delusional. This is a fact that should be taken into account more often. How does the bible describe people of faith? What adjectives are used to describe those who claim Jesus as the Christ and Lord of their lives? These questions oblige clarity of the term adjective. An adjective modifies a noun or a pronoun by describing, identifying, or quantifying words. An adjective usually precedes the noun or pronoun which it modifies. A noun is a person place or thing. There is a direct relationship between noun and adjective. An adjective requires a noun. So in describing what a Christian is or is not what is the noun, what exactly are we describing, what is the person, place, or thing? The noun is Christian is it not, this question seems almost rhetorical, but actually opens up to more than meets the eye. Christian is not a noun, it is an adjective. The disciples were called Christians first at Antioch (Acts 11:26). If a disciple is called a Christian, he is described to be that something, which makes Christian an adjective rather than a noun. Christian was an insulting adjective ascribed to those following Christ; their lifestyles were such that they were called little Christs. This adjective, Christian, is given to a group of men who are following Jesus and living life like it matters. The person is the noun then right? Again, this appears to be another rhetorical question, but drives for further explanation and maddening of your reading experience I’m sure. When you describe a person what do you describe? Adam has tattoos, is funny, has nice style, is analytical, etc. These descriptions only depict perceptions of an outer world. My person, who I am, does not have tattoos, my body does. Me, who I am, does not have nice style, my style is an indication of my preferences. So who am I then? Who are the disciples? Who are Christians? What the heck is the noun already right? The descriptions and adjectives attributed to a person express only who their inner being is, their soul, their conscience, their true being. This noun is the foundation upon which so many adjectives stand. Like the little man behind a curtain our soul is truly who we are. The experience the world or even ourselves perceive is only the outcome or evidence of the inner person, the true being. Carrying on, any description of a person is evidence, unless false accusations, of their true being. The experience of faith is something you are not something you do. This does not need to be misinterpreted as saying actions are not important though. Actions are only reflections of a being though. In my experience I have met many people who want to do certain things so badly because it is what they should be doing or they avoid things they should not be doing. Why though, why try to do something or avoid another thing? What is the basis of reason for such behavior or thought processes? By doing good things a person becomes good. By doing bad things a person becomes bad. If a Christian is supposed to be something is it truly even applicable to try to do these things? If action only reveals identity then it would be foolish to act in contrast to your identity. Your identity cannot reveal something that it is not. External factors cannot reveal something other than what the true identity is. Behavior or morality truly cannot be a method or process. Behavioral efforts may dupe spectators, but ultimately cannot change the being. Doing will not change being. Exertion cannot amend character. In following this cognitive path then, what is the big works hoopla that burdens so many people really about? I fell victim to this burden and was oppressed by its appeal early in my faith and still have daily quarrels with it. Common questions of self examination given by leaders to those followers in the faith are, what can you do for the Lord, what more can you give, what more can you do, how can you become more effective for the kingdom, what are you willing to give up for the kingdom, etc. The familiar thread within these quandaries is effort in order to obtain a greater being. How can you be a better Christian? It is a constant battle some go through that wages war on their soul and exhaust deep into the marrow of their very being. This is an identity crisis. This is a false belief that by doing one can become. A passage that is habitually misinterpreted is one that begs the question of how can I become the salt of the earth or how do I become a light in the world? Jesus is speaking to Jewish folk in this discourse and he calls them the salt of the earth and lights in the world. Jesus describes who they are, who they are born and meant to be. Jesus simply calls out their being. If this is an identity then why weren’t they being salty or light? It is my strong suggestion that they were mislead to think they were someone else. They were burdened down with this false teaching of behavior changing identity. They lost their sense of true identity and thus no longer revealed who they were because they were too busy doing other things, things that would never change who they were. The wizard can alter colors, facial features, voice tones, theatrical effects, environments, or any other element perceived on that big screen, but will always be a little man behind the curtain. The quintessential matter then becomes your being, who you are or who you are not. Many have been deceived to suppose they are something they are not. If action in itself has no influence upon being then how does one discover who they are? Unearthing this precise being from the deep layers of behavioral and environmental factors aides in the establishment of peace and true life. A Christian is one that has put their faith in Christ and Lord of their lives. This interaction begets new and regenerated or restored being. The Spirit of the Lord resides in those who have faith in Him, this spirit is now who you are, your true being. This being is reflected and revealed through behaviors. Behaviors cannot change the being though. So all the moral savvy and obsessed folks are under the false presumption that they can become something. You do not become, you are. Your being is absolute and can stand alone. The most important thing one can do to discover this being is focus in on themselves in reflection to truth. This self-actualization breathes great freedom to be at peace with who they are requiring no more endless cycles of morality obstacle courses. Peace and love are then resident within them and their behaviors and lifestyle show it accordingly. I pray that you study who you are, take a true self-evaluation of who you are, not who you want to be, but who you are. I pray this being can become at peace with who they are. I pray the layers of deception can be pealed away so that liberty and harmony may reign. 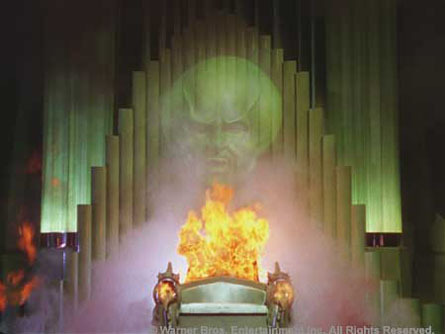 May the wizard cease to exist and the little man step from behind the curtain. May you be!